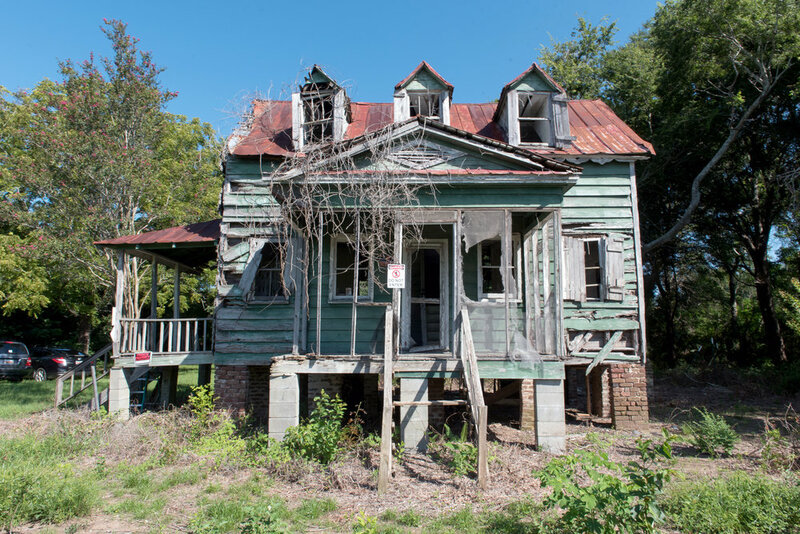 The Hutchinson House—for anyone familiar with Edisto, that phrase stirs many emotions. If you are part of the revered Hutchinson family, the emotion is pride. For the rest of us, we feel joy at the memory the beautiful old house brings. Envy, too, as most everyone wants to live there, despite its state of disrepair. The Hutchinson House has withstood every season and storm, seeming to never alter from its current weathered appearance, as if it just decided it was worn out enough and would age no more. While the back porch that was added on sometime around 1960 simply dissolved off the back, the sturdy main house, built of cypress, has not budged. The red metal roof curls at the edges, and the paint, which must have once been a vibrant green, has bleached in the sun to the exact hue of copper patina. The fine wooden details of the roof’s eaves stay doggedly attached, lending an elegant appearance, like fine hand-knotted antique lace. This spectacular house has been home to a fine and proud family whose history on the island is just as important as any other, and whose strength and perseverance is reflected in their ancestral home. The Hutchinson House is a symbol of freedom, hard work and success. Henry Hutchinson built the house for his wife, Rosa Swinton, circa 1885. Henry obtained the land from his father, Jim (James) Hutchinson. Jim was born into slavery on the Point of Pines Plantation, the son of a slave named Maria and the plantation owner, Isaac Jenkins Mikell. Jim Hutchinson was considered one of the “Kings of Edisto” for his efforts in improving the lives and economic standards for the freed slaves on the island. He raised the funds and purchased the land the Hutchinson House currently sits on, along with a large tract surrounding it that was once the Clark Plantation. Then he divided up the property, splitting the parcels out according to each person's contribution to the purchase. The original plat that was drawn out to show the newly deeded individual lots is currently showcased in the Edisto Island Musem. The Hutchinson family was well educated. Jim, although his level of education is unknown, structured land deals, owned and operated businesses, authored many letters to the governor on behalf of his peers and was a leader in the Republican party through Reconstruction. Henry Hutchinson was more of a family man and less of a community leader, like his father, but he, too, was a savvy businessman, owning and operating one of only a few black-owned cotton gins on the island until the boll weevil brought long-staple cotton to an end in the early 1920s. Jim’s brother, John Pearson Hutchinson, was a well-known architect in Charleston, and along with Jack Miller, he helped Henry build the Hutchinson House as a wedding present for Rosa. John Pearson Hutchinson was also the builder and architect of the Central Baptist Church of Charleston. Family lore suggests that John, Henry and Jack also had a hand in building Sunnyside Plantation, the plantation owned by Jim’s half-brother, Townsend Mikell, that was built after the civil war in 1868. Within the walls of the Hutchinson House, Henry and Rosa raised a happy family with nine children: two girls and seven boys. Both daughters, Lula and Maybel, went on to attend the Avery Institute in Charleston, South Carolina, and became teachers. They prospered, moved from the island and traveled the world. Their family photos depicted through the generations show them happy, successful and traveling to many places abroad, like Paris and Australia. One of the daughters, Maybel, is shown gliding down a New York City Street like a starlet, wearing a hat and gloves. Henry and Rosa made the most of their lives. The struggles and sacrifices of Jim and Maria and the ancestors before them were not wasted. Their family grew healthy and wealthy and reached the dreams of their fathers. Henry passed away in 1941 and the house passed down to his heirs. The last Hutchinson family member to live there was Henry’s great-grandson, Henry Hutchinson, who occupied the house sometime in the 1980s. Now in his late eighties, Henry reminisces about visiting the Hutchinson House daily, as it was across the street from his own home. He recalls sitting on the wraparound porch as a very young boy and watching from behind the railings as men unloaded massive amounts of cotton at the gin. He is still in awe so many years later at the memory of the wagons full of “so many, so, so very many people,” who came to work the fields and farms around the house. The wagons they arrived in stirred up choking clouds of dust. Henry, with a somber tone, remembers his great-grandfather Henry, lying on his deathbed, facing the window over the mill. By the time that Henry moved into the Hutchinson House as an adult, the home had undergone changes. The wraparound porch was no longer there, having been removed and filled in for more space and extra bedrooms. Additions were added on that have since fallen apart or been removed for other reasons. After Henry moved away, there were no more direct family members on the island to occupy the home. Through work and education came jobs and prosperity. The Hutchinson clan had spread their wings and flown to Charleston, New York and other parts of the globe. Their love for the home was deep and they valued it like no other family home. It was their beacon, a symbol, a family home of great importance. This was their Camelot. But what is a family to do with an aging historical home and no one close enough to take care of it? The home was placed in the National Register of Historic Places in May of 1987. Despite this recognition, the family received no funding for its preservation or restoration. Getting permits to restore the home would be tricky, and restoration costs would be too heavy a burden to bear. So the little home sat. Occasionally, there would be a renter, but eventually renting, too, became impossible. The lights were turned off and the door was closed one last time and no one ever came home again. In the Spring of 2016, much to the surprise and delight of many, the Hutchinson House was listed for sale, along with its accompanying 10 acres of farmland. All of Edisto Island was buzzing with the realization that the Hutchinson House was actually for sale. Who would be lucky and brave enough to take on such a substantial preservation project? Despite the excitement, and many people wishing they could, the scope of work needed was just too great to make buying the old house feasible—except for one group, who gathered in board meetings to crunch numbers, make phone calls to secure financing and call in favors. The Edisto Island Open Land Trust (EIOLT) closed on the Hutchinson House in December of 2016. They had managed to secure the funding to buy the house, but now they had to figure out how to save it. The first step was to clear out the brush and plants that had been choking the structure for years, just to be able to figure out what condition the house was actually in. This initial clearing revealed that the back-porch addition built in the 1960s was a total loss and had virtually crumbled into the ground. 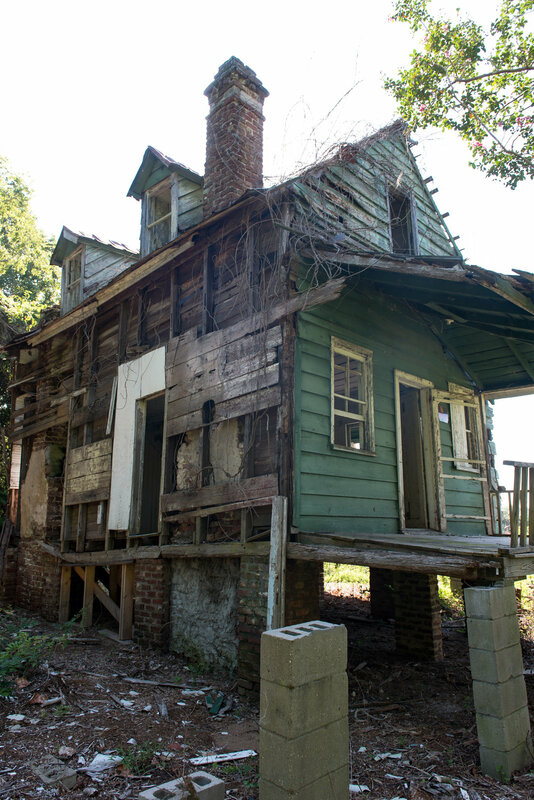 The vines that had taken root and climbed up the back were pulled off to reveal missing siding boards and crumbling handmade bricks on the chimney and pilings from water and root intrusion. The exterior steps up to the house were too dangerous to use, so for safety purposes and to dissuade any curious passersby, the Land Trust removed them. The inside of the home, despite the leaking roof, missing windows and compromised siding, was in surprisingly good condition. The tongue-and-groove floors and walls showed very little decay. The white paint, cracked and peeling, revealed a soft blue color hidden underneath. The wood-planked ceiling and the wooden casing around the fireplaces held firm while the bricks of the rear fireplace fell in on itself. Walking through the house now, the structure feels solid, and the staircase leading upstairs is narrow but firm, holding onto traces of yellow carpet from the 1970s. 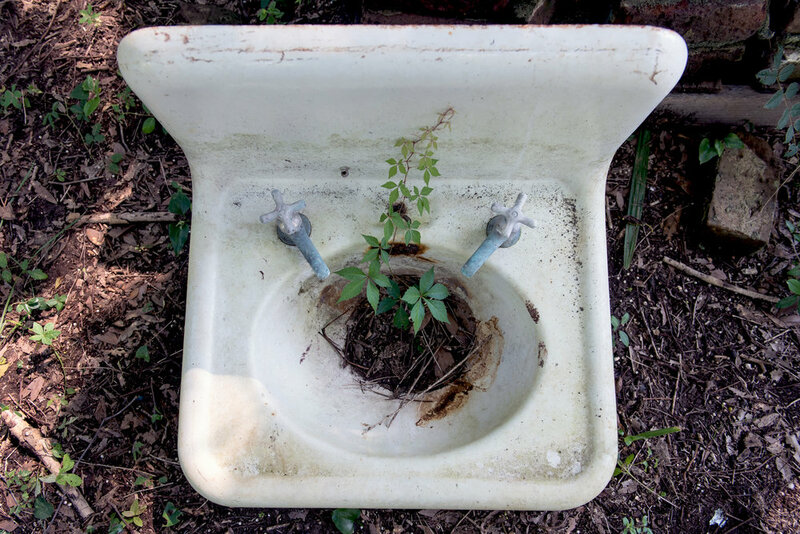 Tiny reminders of its final days as a home in modern times are hidden throughout the home, in stark contrast to the historic details around them. Since EIOLT has acquired the Hutchinson House, the goal is to understand the depth of restoration they are facing, how to approach it, how to fund it and what to do with the building once it is complete. The second step, after clearing all the brush and overgrowth away and shoring up any unstable areas of the home, was to protect it from any further damage from the elements. To achieve this a temporary structure was built over the house. Utilizing funds from donations, the framework went up, followed by a white sheeting roof that covers the roof and top quarter of the building. The new covering also provides shade for the workers and students from the American College of Building Arts (ACBA). Shortly after purchasing the Hutchinson House, the EIOLT contacted the ACBA, who agreed to take on the house as a case study for their preservation class. There’s a possibility the school will be involved in the restoration, which will be determined by the ACBA at a later date. For now, the historic Hutchinson Home is safe and fully protected for future generations to admire. The EIOLT might have taken on its biggest project to date, but there is no other organization on the island better connected or equipped to do this very important job. A special thanks to those that have contributed time, efforts and money to the preservation of this significant part of Edisto’s history. Explore Edisto would like to extend a special thank you to John Girault at EIOLT, Gretchen Smith at the Edisto Island Museum, Henry Hutchinson, and Greg Estevez for their help in exploring the Hutchinson House’s history.